"Do what you love," they say. What if you don’t know who you are or what you love? Entrepreneurial success is more than just how many zeros are in your bank account. The emotional journey that comes with entrepreneurship is not for the faint of heart. Navigating entrepreneurship brings up a slew of emotions that speak to your insecurities, limiting beliefs, and unhealthy perspectives about money, self-worth, and success. When you go down the rabbit hole of discovering who you are and what you love, you’re awakening to your purpose. This guide walks you through the journey of self mastery so you can strategize how to cultivate a personal brand that you can leverage. Use this guide by your lonesome or get a bunch of your entrepreneurial tribe together and leverage this guide for your mastermind. 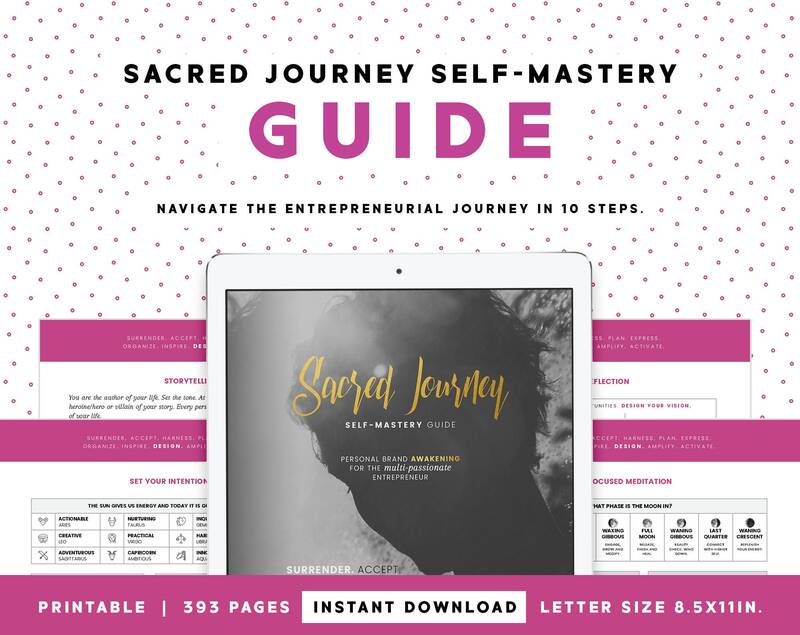 The SACRED JOURNEY SELF-MASTERY GUIDE uses the cards from the Sacred Journey oracle deck. Go through the 10 phases of your sacred journey, with intuition, meditation, and soulfully driven insight! This listing is for the INSTANT DIGITAL DOWNLOAD version of this guide. You will not receive a physical item with this purchase. If you would like to integrate this guide into your coaching practice, connect with me and we can discuss a collaboration. I'm down for creating alliances! However, distribution and resale of this digital download for commercial purposes is strictly prohibited. If you want to use them with your personal mastermind group, go for it but do not in anyway try to pass off the guide as your own. The Interwebs is not as big as you'd like to think and word ALWAYS gets around. I'm a sometimes bruja so let's not test the witchy side that has to step in when someone tries to steal my intellectual property. Thanks sweetie!